10 children's books that discuss adoption, identity, and the different ways that families are created. A great addition to any family's library! Informative resources for LGBTQ parents and prospective parents about the adoption/foster process and the unique challenges that come with it. Check back for updates to this section. 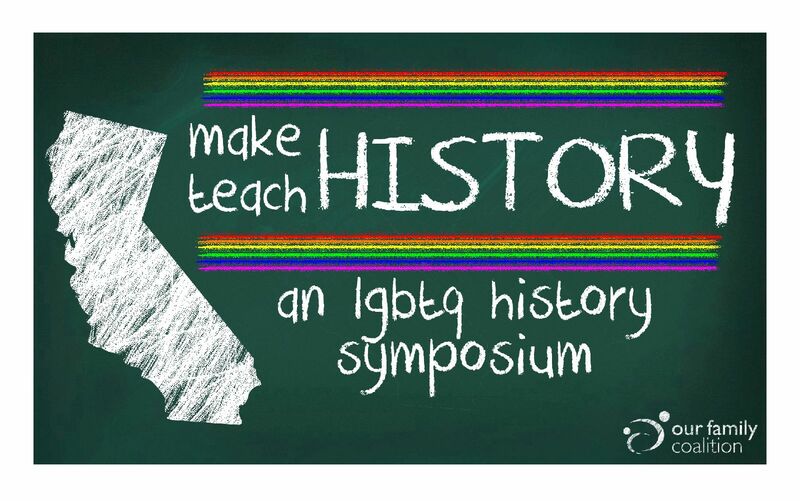 Our Family Coalition is proud to invite you to the inaugural "Make History, Teach History Symposium (MHTH)," a groundbreaking conference in San Francisco where attendees will access successful strategies to teach and effectively incorporate LGBTQ history into existing teaching practices as now required by the passage of the FAIR Education Act. In California, the FAIR Education Act ensures that schools integrate factual information about social movements, current events and history of people with disabilities and LGBT people into existing social studies lessons and prevents schools from incorporating instructional materials that discriminate. Our Family Coalition actively works with schools and districts to develop comprehensive and inclusive curriculum for students. Visit the website to get more information on FAIR and to access lesson plans that that include LGBTQ families and individuals. This is a short list of some simple ways to make the classroom environment more welcoming and inclusive for LGBTQ families and individuals. Also available in Spanish. This is a quick overview of Education Law and Policies in California that apply to LGBTQ students. Gender Spectrum also offers in-person support groups and trainings, as well as an annual summer conference for youth and families. For more information, visit genderspectrum.org/category/we-can-help. The Unicorn Project offers a free art and social group for gender variant and transgender children ages 3-12. Meetings are held in Oakland. For more information including to RSVP and get up-to-date meeting times and locations, contact Rachel Pepper at RLPepper@Hotmail.com. Bay Area Rainbow Day Camp is a summer program designed to empower gender-expansive youth by creating a safe space in which to explore gender identity amongst peers. The camp is held in El Cerrito and offers programs for ages 5-12 and 13-17. Dimensions provides support and low-cost health services for transgender, gender-variant, and queer youth ages 12-25. Dimensions offers a weekly support group run by trans counselors for transgender and gender-variant youth. Trans: Thrive is a safe space by and for the transgender community. The program includes a variety of support and social groups, including a Transfeminine Group, Transmasculine Group, TransEmpowerment, and more. Lyon-Martin Health Services offers primary, preventative, and mental health services in a trans-affirmative environment. The clinic accepts MediCal and MediCare, as well as many private insurance plans, and offers sliding scale fees for patients who are uninsured. An ongoing group offered by Our Family Coalition for trans parents, prospective parents, and co-parents to connect and share what's on their minds. From the workplace to trans activism, transition to temper tantrums, discuss whatever you'd like in a safe space with friendly, supportive people. See the calendar for upcoming meetings. The Multi-Specialty Transitions Department offers culturally competent, comprehensive healthcare services for transgender Kaiser Permanente members, including hormone consultations, surgical evaluations, psychological services, and gynecological care. If you are currently a member of Kaiser Permanente, you can ask your Primary Care Physician for a referral. For information on membership options, visit kp.org. The Gender Pathways Clinic offers integrated, cross-disciplinary healthcare services for transgender and gender-expansive Kaiser Permanente members. If you are currently a member of Kaiser Permanente, you can ask your Primary Care Physician for a referral. For information on membership options, visit kp.org. See our archive of past e-newsletters. To be listed in our community announcements, see the guidelines and form here. For Non-Profits and Community-Based Organizations: Contact us at newsletter@ourfamily.org to be added to our mailing list. Joining the community is free, easy, ensures you'll be the first to know about our great programs, and makes it easy to register you and your family for events.